I had a hankering for banana bread the other day. I don’t make it very often and that’s usually because you have to plan ahead. You need to buy bananas and then let them sit there until they go brown before baking your banana loaf. I guess if you’re the sort that always has over ripe bananas resting in the fruit bowl then it isn’t such a hassle but we’re generally not big banana eaters. I found the recipe about a decade ago in Red Magazine. Now don’t take the piss out of me, I love Red Magazine and have bought every issue since publication. A former colleague of mine (and friend!) who is now a very fabulous features editor for a glossy mag always used to make fun of my love for Red saying I couldn’t be more of a Surrey housewife if I tried. She also made fun of my penchant for toaster toastie bags, which are AWESOME by the way, but I digress. Anyway I baked the recipe which is almost unheard of as I never normally make things from magazines or newspaper supplements. I usually ooh and ahh over the pictures saying “Doesn’t this look delicious?” to my husband whilst he tries to read about politics and The Big Issues and then I forget all about it. 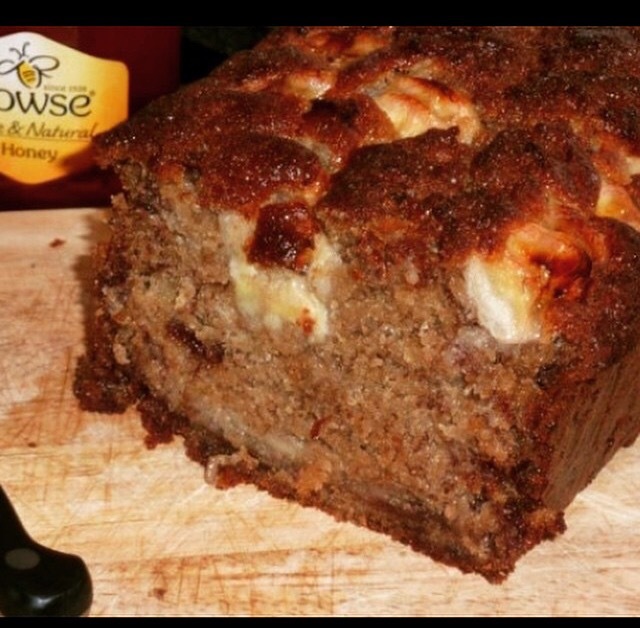 But I made this and it was quite simply the most delicious banana loaf I’d ever eaten. So the recipe was ripped out of the magazine and promptly Pritt Stick’d into my baking notebook for all posterity. Except I lost the notebook until recently, so having found it again I am determined to make it soon but I also thought it might be a good idea to whack it onto the blog as an insurance policy as I really would be sad to lose it. I made various adjustments to the original recipe as I like a really moist bananary Banana bread. Also I don’t include the chocolate chips that were listed, it’s sweet enough without. And I didn’t add cinnamon as I didn’t have any at the time but I don’t feel it loses anything because of it. The cooking times and temperatures are what worked for me in my oven with the changes I made so by all means do what works for you. Butter the insides of the tin and line with baking parchment. Sift the flour, baking powder, bicarb and salt together and set aside. In a small bowl mash 4 of the bananas and mix with the soured cream and vanilla extract. Use a large bowl to beat together the softened butter and sugars together until they are light and fluffy. I’d recommend using an electric mixer for this unless you’re a Olympic rower. If you have a fancy stand mixer go for it! Gradually add the beaten eggs mixing well as you go. Add the flour mixture in two to three batches with the mixer on slow until thoroughly combined. Fold in the banana and sour cream mixture by hand. Spoon the batter into the pre-prepared loaf tin and spread level. Peel and slice the unused banana and toss in lemon juice. This will stop the banana from burning and drying out. Line the sliced banana circles on the top of the loaf, overlapping ever so slightly. Bake on the middle shelf in the oven at 175C for 50 minutes. Then bake at 200C for a final 10 minutes. Or until the skewer comes out clean yarda yada yada… every oven is different and all that. Leave the loaf to sit and cool in the tin for 10 minutes or so. Brush the top with runny honey. Leave sitting for another 20 minutes then carefully lift out and set on a wire rack to cool completely. Once cool you can peel off the parchment and scoff a fat slab with a cup of tea. One of our fave things in this house…I always have bananas in the freezer for just such recipes. Yum! !